Announced earlier this year and shipping this month from DC Collectibles, the Batman: The Animated Series GCPD Rogues Gallery presents a serious problem for collectors who like to take their figures out of the box and let them breathe. DC’s figure line does an outstanding job of replicating the stylized look of the celebrated animated series and its spin-offs, with tight lines and just the right amount of detail. They beg to be played with and displayed outside of their cardboard and plastic packages. Batman and Robin, from our 2016 holiday toy guide. But the GCPD Rogues Gallery, featuring five figures and a host of accessories for $179.95, is aimed squarely at the boxed collector. It’s an elaborate package, with four of Batman’s most infamous enemies staring out from the windows of their cells. The frost on Mr. Freeze’s window is a nice touch. The villains in the set include brainy brawling back-breaker Bane, the as-scaly-as-the-style-allows Killer Croc, the sub-zero suffering of Mr. Freeze and the chlorophyll curves of Poison Ivy. What about the Joker, or Harley Quinn? Turning the box around, we see they had other plans, though the GCPD keeps their rooms just the way they left them. Nice of the GCPD to change the lightbulbs in their cells to reflect the occupants. It’s a beautiful box, and it gets even more beautiful with the lights out. A switch hidden in the roof of the box (most boxes have lids, but this one is special) turns on colored LEDs, painting each prisoner in a sinister light. The effect works better on the smaller figures, but damn if Killer Croc doesn’t look downright dangerous here. Were I not giving you folks a tour of the box’s inside, this one would probably be an exception to my “open all the toys” rule. Luckily it’s not so hard to get the figures back into position once the pictures are done being taken. I wish they came with real prison toilets. Each characters gets their own cardboard cell, with a little hole up top to let the light shine through. Setting them free is a simple matter of undoing a twisty tie and snipping a few translucent plastic bands. First we free Killer Croc, because he is a creepy example of just how good these sculpts can be. I had to take this shot from below, because the figure is so hunched over (appropriately so) you can barely see his ugly mug. 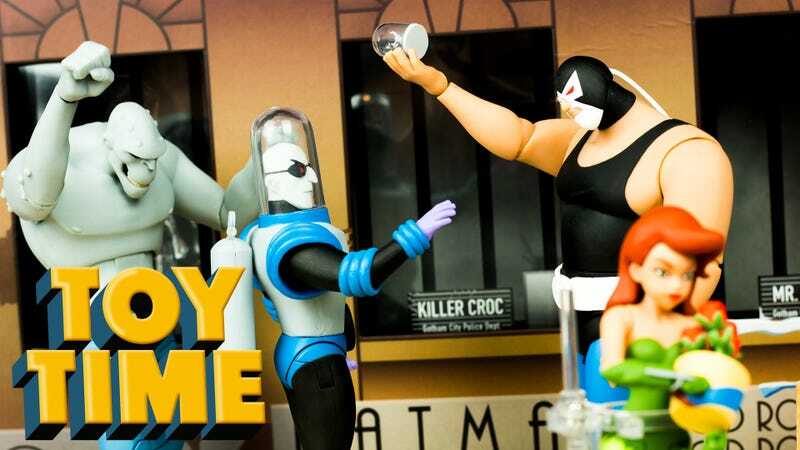 As with all figures in the animated line, Killer Croc and friends come with their own stands, decorated with turnaround images of their cartoon counterparts. Bane remains one of my favorite Batman villains, even after the movie gave him Michael Bay Megatron mouth and a warbling voice. There are smart villains and there are strong villains. Bane is the best of both. All the figures in the set come with additional hands for posing with the provided accessories. Here we see Bane pumping some iron, which seems better than pumping a chemical mixture that turns him into a slobbering rage beast. Batman: The Animated Series established Victor Fries, AKA Mr. Freeze, as a tragic character. The show introduced his terminally-ill wife, Nora, and presented Fries as a man driven to save the woman he loves, rather than a crackpot with an ice gun. The box set does a fine job of rendering Victor in three dimensions. He even gets a tiny snow dome featuring his wife, just to make fans cry. Rounding out this frightful four is Poison Ivy. She’s pretty tiny, especially standing next to her much bigger criminal brethren. As a smaller, slighter action figure, there’s not too much to Poison Ivy here. Green clothes, arched eyebrows and a house plant. Seriously, who let Ivy have a house plant in jail? Well now I’ve done it. Four of Gotham’s most fearsome villains, freed from their prison and about to go on a rampage. With Batman off celebrating the show’s 25th birthday, who can possibly stop them? Wait. Who’s that on the side of the box? Why it’s officer Renee Montoya of the GCPD. Her figure’s built of sterner stuff than Ivy’s, but can a lone cop rein in a quartet of quarrelsome criminals? Oh you know she can. With her swappable heads, shotgun and pistol, Montoya is ready for just about anything Gotham’s criminal element can throw at her. Between her amazing sculpt and her role in the box set, she’s my favorite figure of the bunch. I was considering bringing in Batman or Superman to help, but Renee has got this, no Question. The Batman: The Animated Series GCPD Rogues Gallery five-pack is now available for preorder direct from DC.